17.08.2016, Oststeinbek (Germany) – Japanese cooling expert Scythe adds the new premium-grade Kaze Flex 120 mm case fan series to its portfolio. The Kaze Flex PWM fan had its debut with the award-winning Mugen 5 CPU Cooler followed by today’s release of a whole line-up of 5 models. The new line-up is featuring two PWM models with a dynamic fan speed range as well as three regular models with constant speeds. Thanks to the unique Sealed Precision FDB bearing, all Kaze Flex 120 mm case fans assure excellent quietness and very long life span of 120.000 hours. The fans are equipped with an integrated anti-vibration system, which is made of shock absorbing rubber pads in the corners of the frame in order to prevent the transfer of vibration. It is thanks to these advantages, that Kaze Flex 120 series is well suited to be used as either a reliable case fan or versatile companion for a CPU Cooler. Scythe offers two Kaze Flex 120 PWM models with a dynamic fan speed range, which can be controlled using the motherboards PWM fan controller. The model SU1225FD12M-RHP suits the most purposes thanks to its wide fan speed range from 300 to 1.200 RPM. It is the exact same model as the one supplied with the award-winning Mugen 5 CPU Cooler. Users seeking a reliable and really silent fan are going to love the model SU1225FD12L-RDP due to its narrow PWM bandwidth of 300 to 800 RPM, which allows it to operate at incredibly low noise levels from 4 to 14,5 dBA. 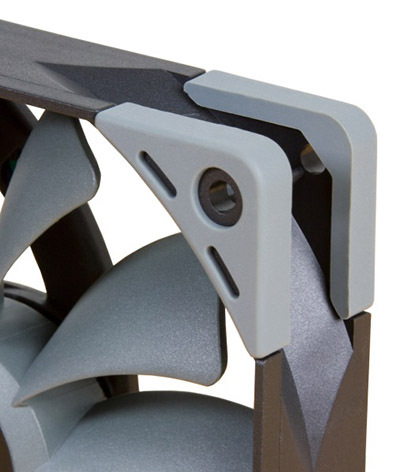 The regular Kaze Flex 120 mm case fans are divided into 3 models and tweaked for different fields of application. Maximum airflow for power-users reaching 89,04 CFM (151 m³/h) at 2.000 RPM is assured by the SU1225FD12H-RP model, whereas steady airflow at almost inaudible 14,5 dBA is covered by the 800 RPM model (SU1225FD12L-RD). In between these two versions is the all-rounder SU1225FD12M-RH, which runs at 1.200 RPM. All fans from the Kaze Flex 120 series are equipped with the premium-grade self-contained fluid dynamic bearing (Sealed Precision FDB). The bearing guarantees an exceptionally high level of stability and durability, Both the bearing and the spindle are made entirely of high quality compressed metal and lubricated by a special oil film resistant to temperatures of up to 250C° / 480F°. This drastically reduces friction, ensuring smooth operation and minimized wear, which results in an average life-span of 120 000 hours. All corners of the Kaze Flex 120 frame are equipped with shock absorbing rubber pads, which prevent the transfer of maybe occurring vibrations from the fan to the case or the CPU cooler. To further ease the installation process and increase the compatibility, Kaze Flex 120 fans are utilizing installation holes without tunnels and come with a 3-pin to 4-pin adapter for connection to the PSU. The connection cable is properly sleeved and has the ideal length of 50 cm. The Scythe Kaze Flex 120 fans are available as of today in Europe. 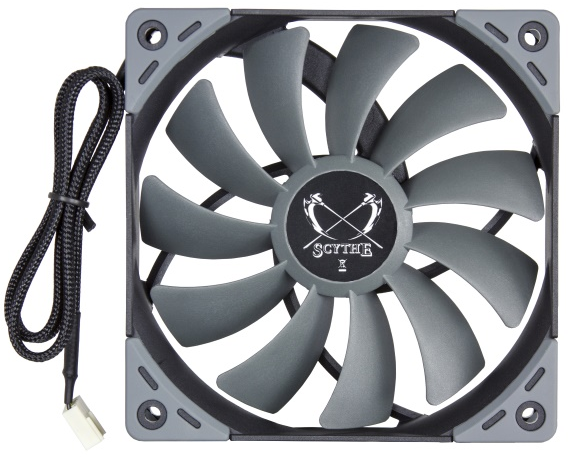 Scythe is one of the world’s leading manufacturers of CPU coolers, graphic card coolers, fans, fan controllers, power supplies, cases and other PC accessories. Operating since November 2002, is headquartered in Tokyo (Japan) and has offices in Oststeinbek (Germany) and Taipei (Taiwan).